I have THE most wonderful neighbors! One of those couples are Joan & Chuck. They are the BEST example of family monarchs! There is always a crowd of cars gathered around their house for holidays, birthdays, or any excuse they can come up with to gather their family together.Their granddaughter, Jenny and her husband, John, just made them great grandparents. 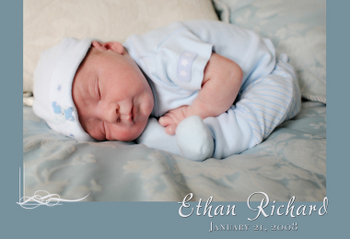 Little Ethan Richard was born January 21st. He was 8 lbs and 20 1/2 inches long. I was honored to be asked to photograph this new little blessing. He has no idea how loving and loyal his new family is, but he will soon! It was nice to meet John's side of the family too! What a treat to be able to photograph 2 sets of great grandparents and a set of grandparents. John's sister also came . Ethan was a little dream and it will be fun to see him grow, especially since he will be visiting right across the street! Well, here's a slideshow to show him off!Click here to listen and view! Be sure to leave a comment and show the love! Those pictures were just adorable. I can't believe lil' Jen from across the street is a wife and now a mommy. I also loved the pictures with Joan and Chuck. Joan is just a natural with babies. Such a sweet lady. Another job well done Geanette. Bravo!!!!! Jill- I can't wait to photograph another newborn for you!! Your wonderful Matthew was my first newborn session ever and I ADORE those shots of the 3 of you. Thanks for the complement! I love ya too! wow.... i'm totally all teared up. Those are priceless and I just love the moments you captured. You're so very talented and put your whole heart and soul into this and I hope you know what your creating for these families. I can't wait for you to photgraph our next little bundle of joy! Wow..How sweet of you Cathy! I appreciate the complement! This is huge since you have a beautiful new grandbaby yourself! Thanks again! Your amazing. Those pics brought tears to my eyes. I love the grandparents and great grandparents. What cherished memories those will be. I'll get with you sometime this week to finalize my order for Kaylin's pictures.